LONG TERM GOAL: I am still working hard on my 5 ball and 6 ball juggling! STANDARD TO REACH: To continue to expand my routines so that I can better tailor my future shows to each individual client. Have at least one or two difficult tricks that you keep coming back to. Stand out from the Crowd – You are unique as a person, but how can you stand out from the crowd as a juggler? I spent part of August at Edinburgh Fringe, and when I watched the street acts, they always seemed to build up to the same grand finale which was to juggle fire or knives on a giraffe unicycle! Some of them even used the same jokes as the previous acts. What can you do to stand out from the others? Pick some props to learn that are not widely used by jugglers. Write some really good original comedy material. See my 4th Newsletter – Using Comedy in your Juggling Routines for an article on this very subject! Picking songs for your act that aren’t used by every other juggler for their routines. My 3rd Newsletter – Developing a Routine to Music has an article on using music in your routines. Develop a unique character or onstage presence. 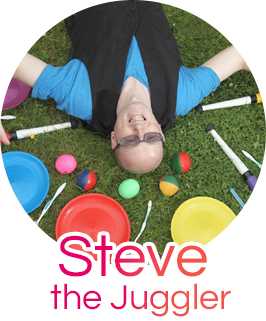 If you do not already attend a juggling club or conventions, then please let me know and I will point you to your nearest locations. Anyone wishing to improve their skills should attend these events. There are over 125 juggling clubs in the UK! I hope that this article will help you to find a way of improving your juggling skills and developing as a performer. Jugglingworld Massive Sale Now On! As of 21 September 2007, I have reduced the prices of 95 products in the store. I aim to phase out most of the novelty items side of the business and concentrate more on the juggling side of the store from now on. There are vast reductions in particular to the Games and Puzzles section. Many items are below cost price, so grab yourself a bargain before they run out! 50 new products added since April 2007. Plans for a Fire Juggling Products page are underway. I am just checking all the legal implications of selling such equipment before I make the final decisions. Bar Flair – The New Craze! There is a new Bar Flair section on the site. If you are unsure what this is, then visit my Bar Flair Products Page and you can click on the video link to see the Britain’s Got Talent Bar Wizards duo performing their routine which got them to the Grand Final of the Simon Cowell Talent Show earlier this year. There is also now a Bar Flair Tricks Page and 4 DVD’s available for further learning. This summer, I have been all over Scotland, including a memorable trip to perform at Isle of Lewis Highland Games during the Summer. I had 10 gigs teaching Italian and Spanish students to Juggle as part of their weeks intensive English Language study courses in Edinburgh and Glasgow. Thankfully I wasn’t expected to speak any of their language, and it is great how juggling can be taught using body movement and actions rather than just words! Lastly, I tried my hand at being a Motivational Speaker for the Chartered Institute of Personnel Development. Afterwards I was approached by the participants and offered lots more work, so maybe this is a new sideline for me?! My next newsletter will be out before CHRISTmas, so I will be in touch soon!